The Chairman, Nigerian Ports Consultative Council (NPCC), Kunle Folarin, says Nigeria controls 70 per cent of cargo traffic of West and Central Africa. Mr Folarin made this known on Friday in Lagos during the 3rd Annual Maritime Conference in honour of Taiwo Afolabi, the Chief Executive and Vice Chairman, Sifax Group. The Theme of the conference was: “Port Costs and Ports Charges: A Recurring Decimal under Port Reform Regime”, held on Friday in Lagos. According to the maritime economist, the percentage is far from the formal trade alone and will certainly be bigger if we consider the informal trade aspects of cargo movements. He said that the traffic into Nigeria by latest data was over 5,307 ships per annum. “The potential is certainly bigger when we consider the capacity of cargo traffic to Nigeria’s landlocked neighbours such as Niger Republic and Chad. “In real terms, over 85 per cent of all the goods and services that entered Nigeria came through the seaports. “The current aggregate value exceeds $15 billion dollars a year through normal imports. “Nigeria also imports over two million tonnes of non-oil cargo yearly. “It is therefore, no doubt that the maritime sector’s performance is indeed a major contributor to the economy and must be given attention when discussing port costs and port charges. “In 1970, following the end of civil war in Nigeria, government adopted a policy that focused on the need to reconstruct the infrastructure and superstructure of areas that were crucial to the commercial and industrial sectors of the country. “In order to give effect to the implementation of the policy, importation of building materials was done by about 600 vessels, most of which arrived at the same time and created port congestion,” Mr Folarin said. 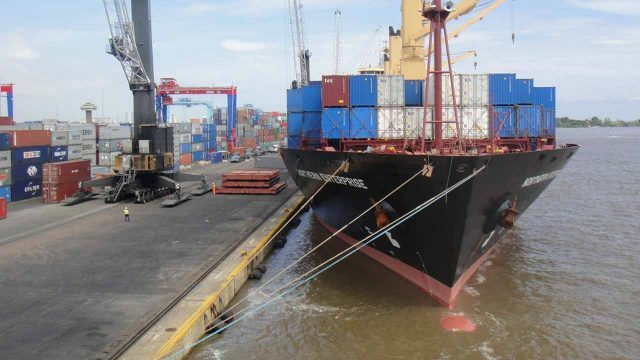 He recalled that the available port infrastructure at that time could not handle more than 12 vessels at a time in Apapa Port Complex, which resulted to long queue of ships waiting to berth. Mr Folarin said that consequently, ship owners incurred huge running costs and this led to demurage as a result of penalties put in place by the chartered parties. He said that the port cost and charges reform policy of the Federal Government started in 1993 by the Federal Ministry of Finance apparently to address the issue of rising costs in the delivery of port services and several others. The NPCC boss said that the port concessioning started in 2006 by transfering operations of public sector activities to private sector to improve productivity and achieve competiveness at the ports. He said that there was need for port industry to be truly productive, competitive and earn a hub status in the region, adding that otherwise, Nigerian ports would continue to perform at best a little above average. In a keynote address, Mr Afolabi, who was represented by his daughter, Mirian Afolabi, recalled that the exchange rate of Naira to dollar in 2006 was between N125 and N131. “Many obligations of terminal operators are expected to be discharged in dollars and how much naira will be enough today to purchase the required dollars,” he asked. Mr Afolabi said that 12 years after the historical concession, the value of naira had changed. “By what percentage will the cost of service be adjusted upward to reflect the astronomical change in foreign exchange regime? “So many questions seeking answers. “These are matters of immediate and practical concern to every Nigerian and the regulatory authorities,” Afolabi said. He commended the organisers of the Maritime Forum, who were students of the Faculty of Law, University of Lagos, for the steadfastness and diligence they demonstrated in sustaining the yearly event. In his opening remarks, a former Managing Director of the Nigerian Ports Authority (NPA), Adebayo Sarumi, said that government should not run port operations, adding that it was indeed a business for the private sector. Mr Sarumi said that port concessioning was a business venture that concerned both the consumers and the producers of shipping services. “Up to the time I returned to NPA in 2003, NPA was using the tariffs that we got from the Price Income and Productivity Board, approved in 1993. “It was so surprising to see that a tariff of 1993 was still being used in 2004. There is no way you could do that business gainfully. “More worrisome was the quality of service NPA was giving. Low turnaround time of ships and shallow channels,” Sarumi said. He, however, urged government to ensure that port infrastructure were in good shape. Mr Sarumi recalled that immediately the concession started, APM Terminals invested heavily on infrastructure and bought 11 cranes. A former President, Association of Nigerian Licensed Customs Agents (ANLCA), Olayiwola Shittu, said that there was need to look for lasting solutions to the continuous problem of rising port costs. Mr Shittu said that things could only change positively in the industry if all the operators were ready to positively change their attitude. Also speaking, the Executive Director, SIFAX Group, retired Maj Henry Ajetunmobi, said that terminal operators invested a lot of funds on additional port infrastructure. The Director General, Nigerian Chamber of Shipping, Obiageli Obi, said that there was need to bring down the high costs to encourage port business. A Maritime Lawyer, Victor Onyegbado, said that there was need to have an economic regulator as well as the enactment of the Port and Harbour Bill.